This is a Navaho figure which I learned at the St. Louis Exposition, in November, 1904. It was shown to me by the same two Navaho girls. First: The same as the First movement of "Little Fishes." Second: Pass the right thumb away from you over the right lower near index string, and pick up from below on the back of the right thumb the right lower far index string, and return the right thumb to its position (Fig. 533, Right hand). Third: Pass the left thumb away from you over the left lower index loop and pick up on the back of the left thumb the left upper far index string, and return the left thumb to its position (Fig. 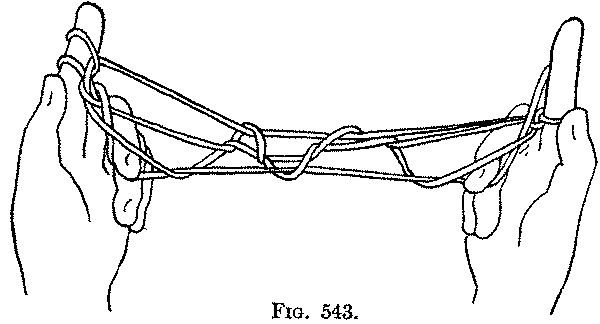 533, Left hand). 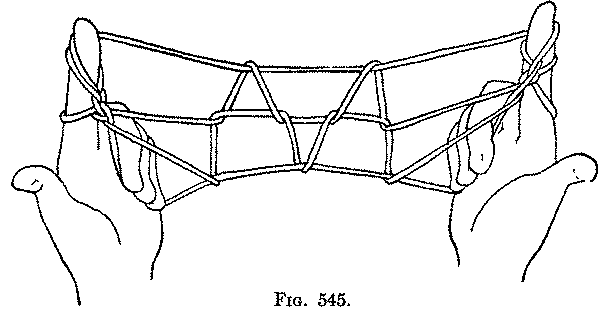 Fourth: Pass the middle, ring and little fingers of the right hand from below into the right upper index loop; and pass the middle, ring and little fingers of the left hand from below into the left lower index loop (Fig. 534). 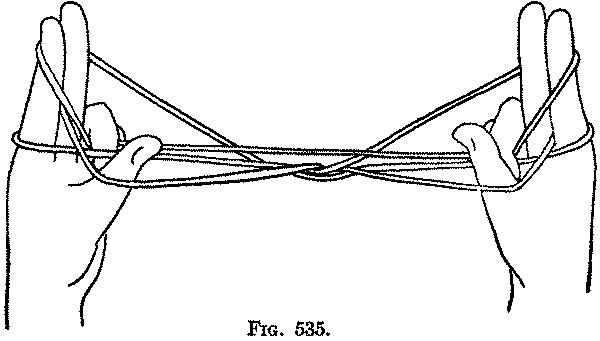 Bend the middle, ring and little fingers of each hand toward you over the upper near index string, and pull this string down by closing the three fingers down on the palm (Fig. 535). 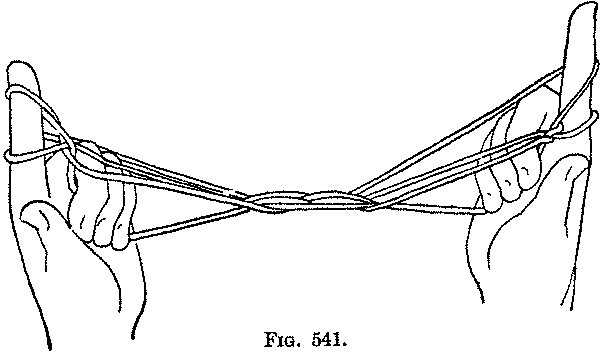 Fifth: Holding the string down with each ring and little finger, bend the middle finger toward you over the lower near index string (Fig. 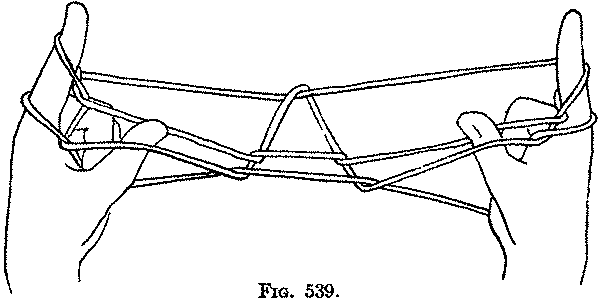 536), and pull it in the bend of the finger away from you over the upper near index string; release the upper near index string from under the ring and little fingers (Fig. 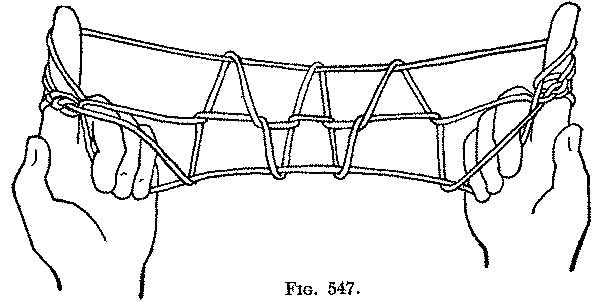 537), and put the ring and little fingers toward you beside the middle finger to assist in holding down the lower near index string; then release the loops from the thumbs and draw the strings tight (Fig. 538). You now have one "storm cloud" extended between the index fingers and the other fingers closed on the palms. The central figure is symmetrical; it is a triangle, crossed by a straight horizontal string and sending, on each side, two diagonal strings to the index finger. The strings are differently arranged, however, on the two index fingers: On the right index, the upper far string forms the straight string at the top of the figure, and then becomes the lower far string on the left index; and the lower far string forms the right upper diagonal string. On the left index, the upper far string is continued toward the centre of the figure as the left upper diagonal string. 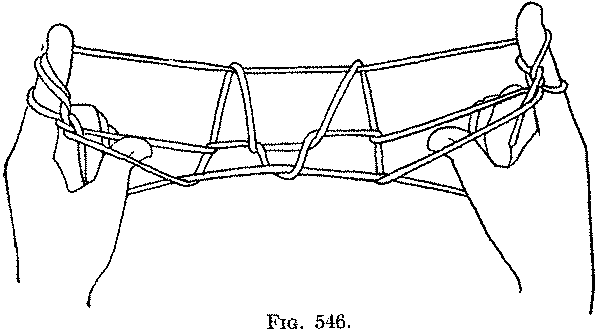 On each side, the lower diagonal string is the upper near index string, and the string held down by the middle, ring and little fingers is the lower near index string. Sixth: Pass each thumb away from you under the lower diagonal string, then between the two diagonal strings (Fig. 539), and bending the thumb away from you over the upper diagonal, draw it down toward you in the bend of the thumb under the lower diagonal. 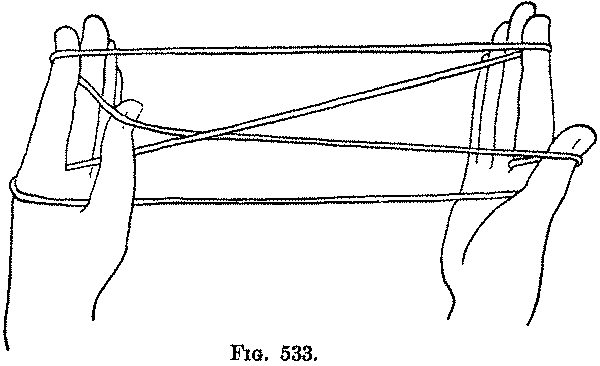 Release the string held down by the middle, ring and little fingers (Fig. 540). 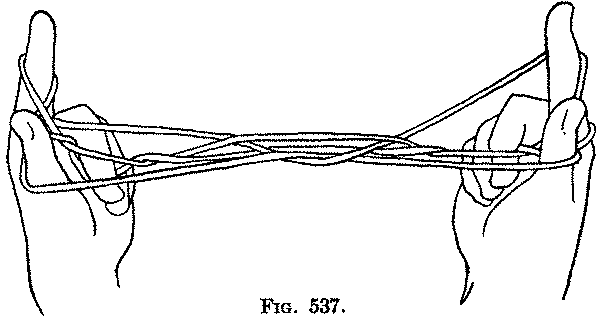 Put the middle, ring and little fingers of each hand toward you through the loop held by the thumb and withdraw the thumb, and close the fingers down on the palm (Fig. 541). Seventh: Pass each middle finger up on the near side of the two diagonal strings, and then up away from you to the far side of the upper string of the figure (formed of the right upper far index string and the left lower far index string) (Fig. 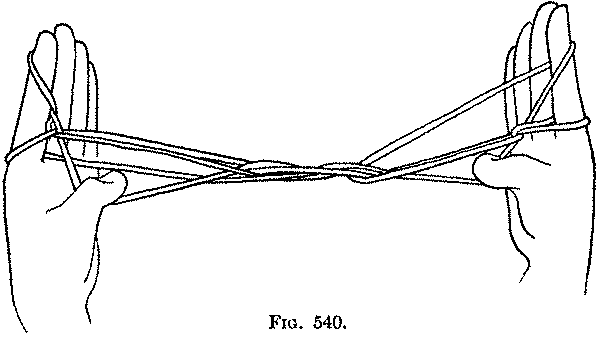 542), and, bending the finger toward you, pull this upper string down through the loop held down to the palm by the ring and little fingers; then slip the ring and little fingers out of the loop they have been holding (Fig. 543), and put them toward you into the loop held by the middle finger, and close all three fingers down on the palm (Fig. 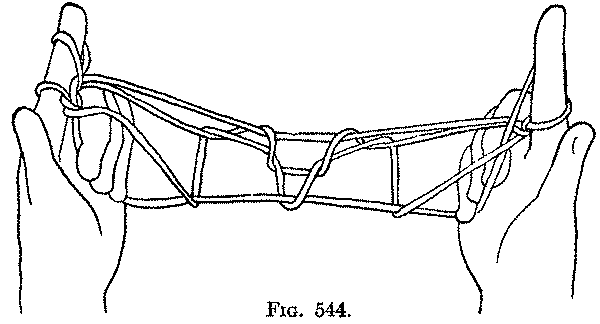 544). 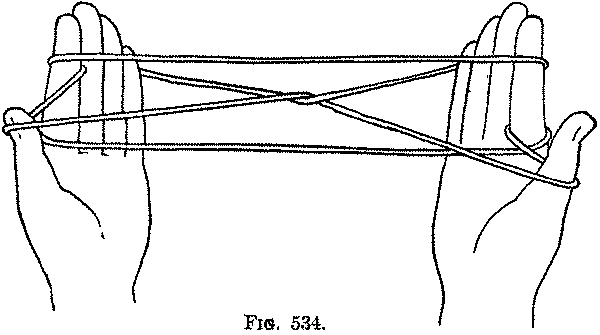 Eighth: With each index pick up from the far side at some distance from the index the straight transverse lower near index string, and straighten the index to loop the string around its tip (Fig. 545). The lower near index string can be found by following it carefully from the index toward the centre of the figure. 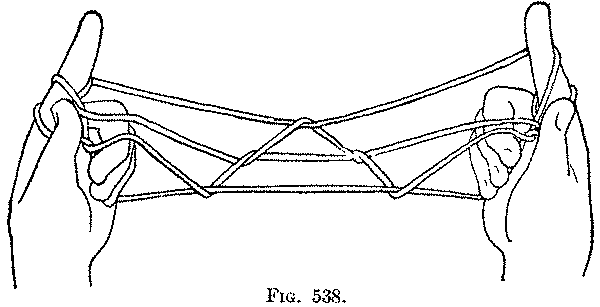 The figure now has a top string and a bottom string extending two triangles—the two "storm clouds"—and two strings on each side corresponding with the former diagonal strings. Ninth: Put each thumb away from you and up on the far side of the lower diagonal, and then on the near side of the straight string corresponding to the upper diagonal (Fig. 546); bend the thumb away from you over this upper string, and pull it toward you in the bend of the thumb under the lower diagonal. Release the string held down by the ring and little fingers, and put these fingers toward you through the loop held by the thumb, and withdraw the thumb, closing the fingers down on the palm. 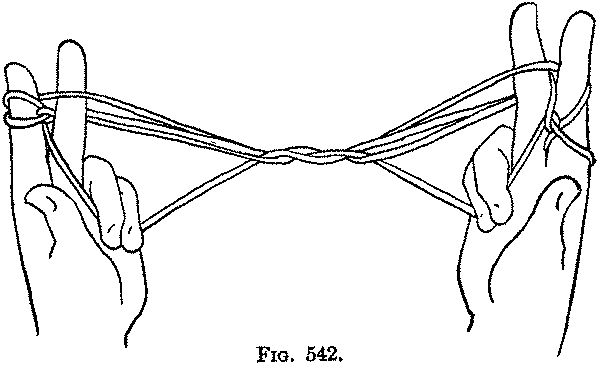 Tenth: Pass each middle finger upward on the near side of the two strings corresponding to the diagonals, and on the far side of the upper string of the figure, and, bending the finger toward you, pull this upper string down through the loop held down to the palm by the ring and little fingers; then slip the ring and little fingers out of their loop, and put them toward you into the loop held by the middle finger, and close all three fingers on the palm, at the same time releasing the top loop from each index. Eleventh: With the right index pick up from the far side the right upper far index string; and with the left index pick up on the far side the left lower far index string, and straighten the index fingers. This movement puts a loop around the tip of each index (Fig. 547). You now have three "storm clouds"—three triangles between the upper and lower strings—and two strings on each side running to the index. Twelfth: By repeating the Sixth and Seventh movements, releasing the top loops on each index, and then repeating the Eighth movement, four "clouds" can be formed. Thirteenth: By repeating the Ninth and Tenth movements, releasing the top loop on each index, and then repeating the Eleventh movement, five "clouds" can be formed. Fourteenth: By repeating the Twelfth movement, six "clouds" can be formed. Fifteenth: By repeating the Thirteenth movement, seven "clouds" can be formed. I regard this figure as the most difficult of all, because of the complication, introduced at the outset, by the two thumbs picking up different strings and because of the subsequent difficulty of finding the proper strings to pick up owing to the tight twists which grow around the index fingers. The Indian notion of "storm clouds" can be seen in the small drawing placed at the beginning of the game; this is copied from a Moki pictograph of "clouds with rain descending" (see Garrick Mallery, p. 238, Fig. 164). The same design occurs on the Navaho blankets of the present day.